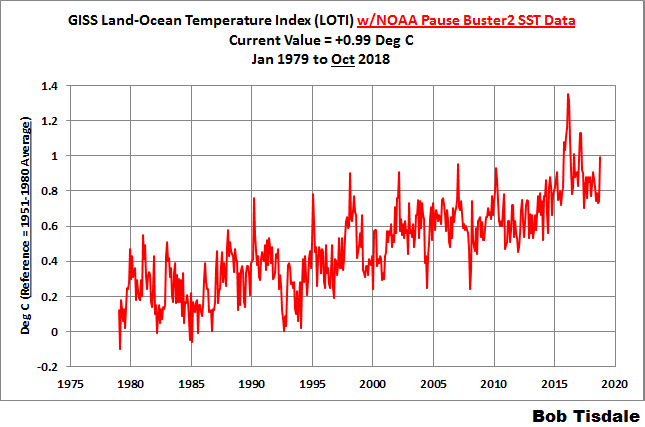 As you’ll soon see, there was an eye-catching uptick (+0.25 deg C) in the GISS global Land-Ocean Temperature Index (LOTI) data from September to October 2018. We’ll have to wait for next month’s update to see if it also appears in the NOAA and Met Office datasets. 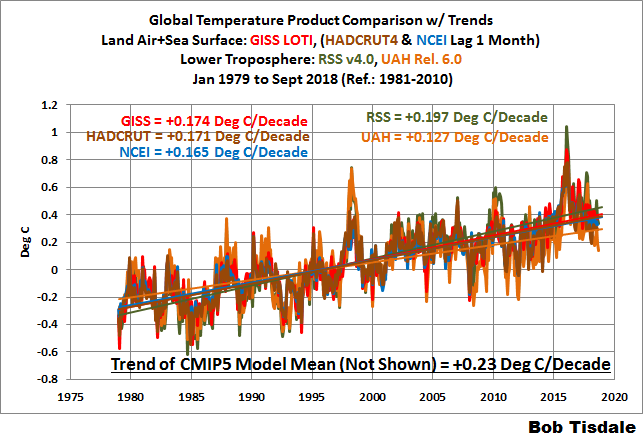 This post provides updates of the values for the three primary suppliers of global land+ocean surface temperature reconstructions—GISS through October 2018 and HADCRUT4 and NOAA NCEI (formerly NOAA NCDC) through September 2018—and of the two suppliers of satellite-based lower troposphere temperature composites (RSS and UAH) through October 2018. It also includes a long-term model-data trend comparison, which shows a number of major flaws in the climate models used by the IPCC for their 5th Assessment Report. I took a hiatus from blogging for almost two years. During my absence, in July 2017, RSS (Remote Sensing Systems) revised their lower troposphere temperature data with their version 4.0 data. See the RSS webpage FAQ about the V4.0 TLT Update for more information. We briefly discussed the impacts of these changes recently in the post The New RSS TLT Data is Unbelievable! (Or Would That Be Better Said, Not Believable?) A quick Introduction (Cross posted at WattsUpWithThat here.) 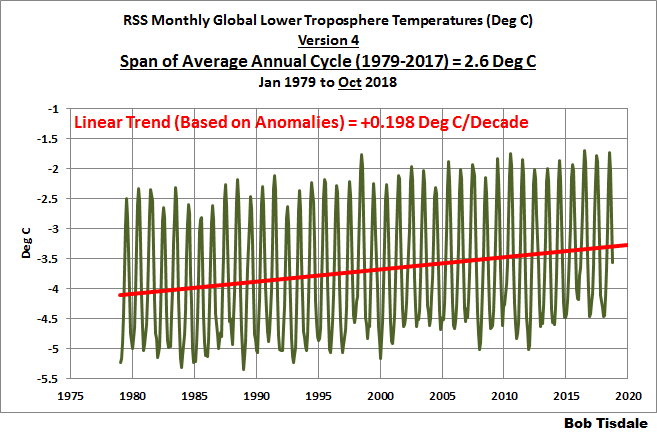 Dr. Roy Spencer also discussed the revised RSS v4.0 TLT data in his post Comments on the New RSS Lower Tropospheric Temperature Dataset, which was cross posted at WattsUpWithThat here. 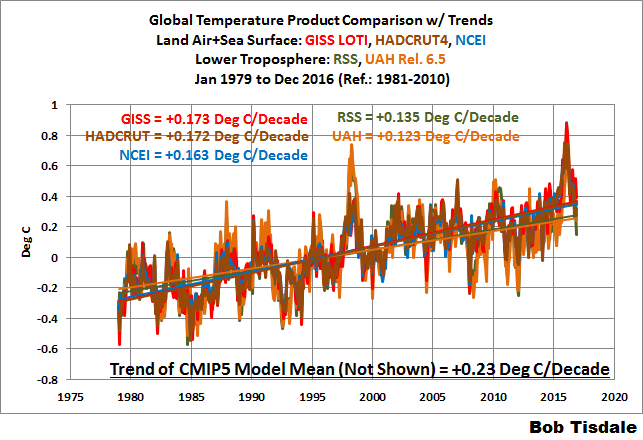 And I’m also continuing to present the model-data 30-year trend comparison using the GISS Land-Ocean Temperature Index (LOTI) data. Update: The October 2018 GISS global temperature anomaly is +0.99 deg C. According to the GISS LOTI data, global surface temperature anomalies made a sizeable and very-noticeable uptick since September, a +0.25 deg C increase. Update (Lags One Month): The September 2018 NCEI global land plus sea surface temperature anomaly was +0.78 deg C. See Figure 2. It made a minor uptick (an increase of about +0.04 deg C) since August 2018. 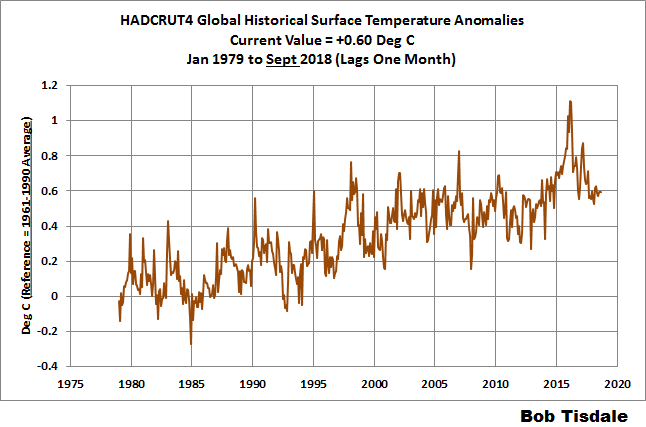 Update (Lags One Month): The September 2018 HADCRUT4 global temperature anomaly is +0.60 deg C. See Figure 3. It basically remained the same since the prior month, with a teeny +0.01 deg C uptick from August to September 2018. The monthly UAH lower troposphere temperature composite is the product of the Earth System Science Center of the University of Alabama in Huntsville (UAH). UAH provides the lower troposphere temperature anomalies broken down into numerous subsets. See the webpage here. The UAH lower troposphere temperature composite are supported by Christy et al. (2000) MSU Tropospheric Temperatures: Dataset Construction and Radiosonde Comparisons. 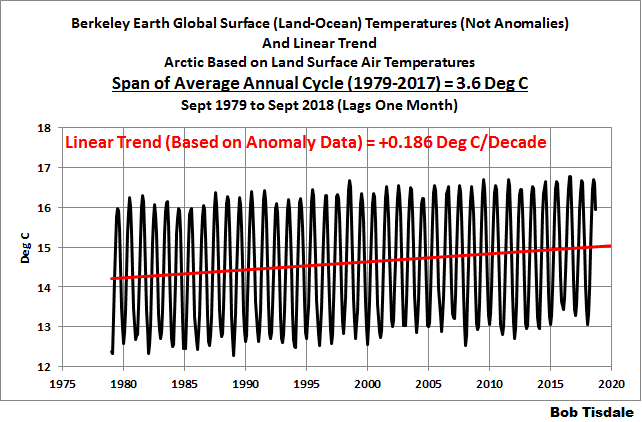 Additionally, Dr. Roy Spencer of UAH presents at his blog the monthly UAH TLT anomaly updates a few days before the release at the UAH website. Those posts are also regularly cross posted at WattsUpWithThat. The UAH lower troposphere temperature product is for the latitudes of 85S to 85N, which represent more than 99% of the surface of the globe. UAH uses the base years of 1981-2010 for anomalies. The UAH lower troposphere data are now at Release 6. See Dr. Roy Spencer’s post here. Those Release 6.0 enhancements lowered the warming rates of their lower troposphere temperature anomalies. See Dr. Spencer’s blog post Version 6.0 of the UAH Temperature Dataset Released: New LT Trend = +0.11 C/decade and my blog post New UAH Lower Troposphere Temperature Data Show No Global Warming for More Than 18 Years, both of which were published 3 years ago in 2015. The UAH lower troposphere anomaly data, Release 6.0, through October 2018 are here. 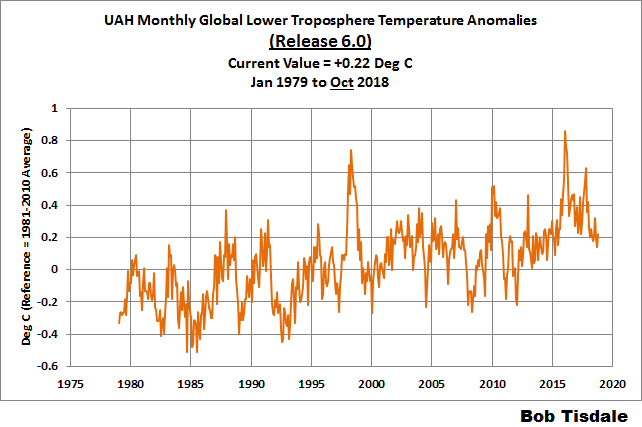 Update: The October 2018 UAH (Release 6.0) lower troposphere temperature anomaly is +0.22 deg C. It rose noticeably since September (an increase of about +0.08 deg C). Update: The October 2018 RSS lower troposphere temperature anomaly, Version 4, is +0.53 deg C. It rose a bit (an uptick of +0.04 deg C) since September 2018. Figure 7 presents the average of the GISS, HADCRUT and NCEI land plus sea surface temperature anomaly reconstructions and the average of the RSS and UAH lower troposphere temperature composites. Because the HADCRUT4 and NCEI products lag one month in this update, I’ve only updated this graph through September. 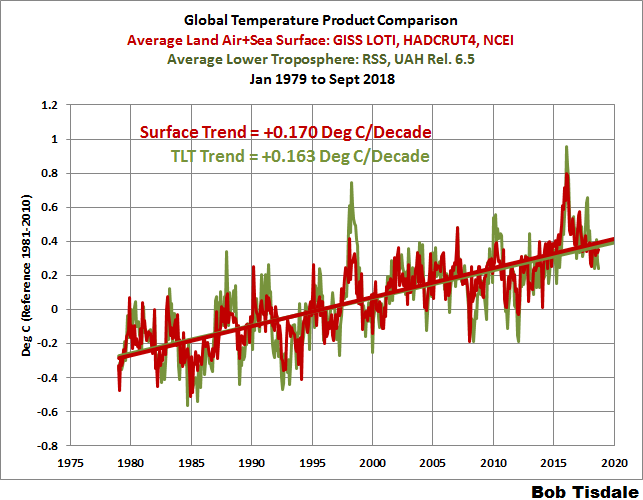 What’s really obvious is that the recent update to the RSS TLT data has brought the trend of the average TLT data more into line with the trend of the average of the surface temperature data. See the graph here for a full trend comparison with the older version of the RSS TLT data. Sorry, that’s the last one I have on file. 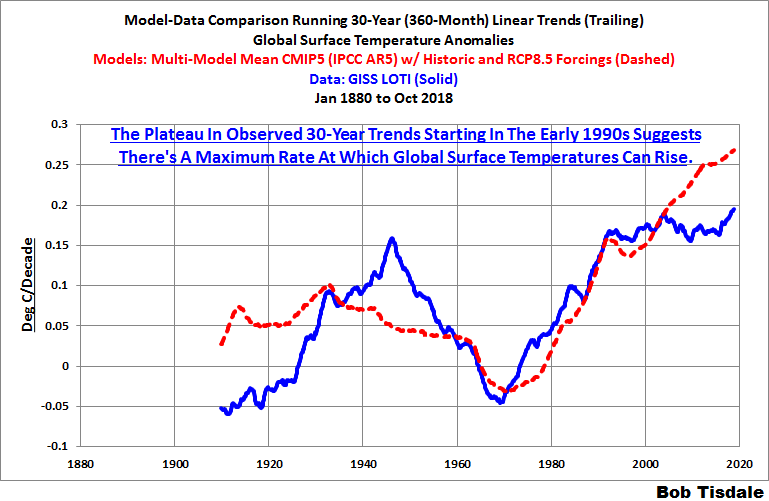 One of the best ways to show how poorly climate models simulate surface temperatures is to compare 30-year running trends of global surface temperature data and the model-mean of the climate model simulations of it. See Figure 8. 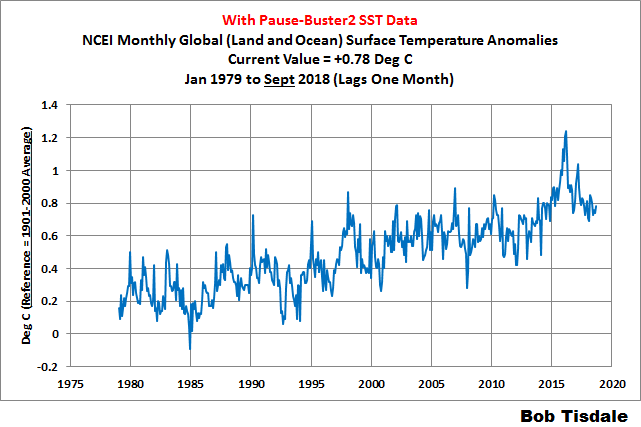 In this case, we’re using the global GISS Land-Ocean Temperature Index for the data. For the models, once again we’re using the model-mean of the climate models stored in the CMIP5 archive with historic forcings to 2005 and worst case RCP8.5 forcings since then. See the post On the Use of the Multi-Model Mean for a discussion of its use in model-data comparisons. I haven’t published a monthly sea surface temperature update since October 2016, with the most recent update found here. The satellite-enhanced sea surface temperature composite (Reynolds OI.2) used to be presented in global, hemispheric and ocean-basin bases in those posts. I may start updating them again regularly in the near future. Then again, I may not. It depends on if there’s enough call for it by visitors. 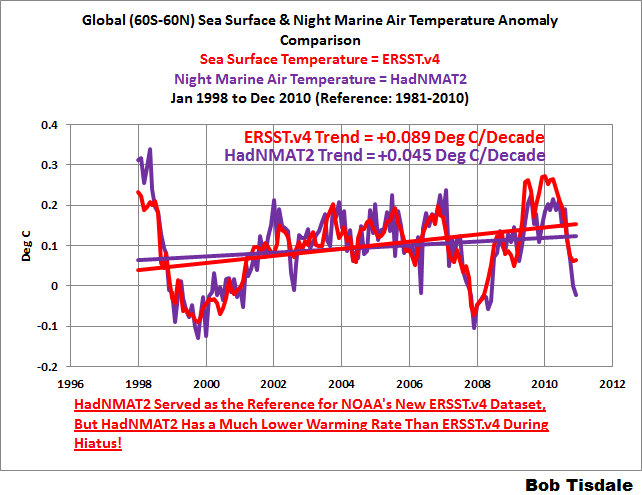 We discussed the recent record-high global sea surface temperatures for 2014 and 2015 and the reasons for them in General Discussions 2 and 3 of my most recent free ebook On Global Warming and the Illusion of Control (25MB). (And, of course, the record highs in 2016 are lagged responses to the 2014/15/16 El Niño.) That book was introduced in the post here (cross post at WattsUpWithThat is here). I’ve added two graphs to these updates. The new graphs are being added for a simple reason: to provide different perspectives on the increases in global temperatures since 1979. Figure 9 presents the Berkeley Earth global land+ocean surface temperatures in absolute form, with land surface air temperature data for Arctic sea ice (data here). This is created by adding the “Estimated Jan 1951-Dec 1980 monthly absolute temperature (C)” listed there to their respective monthly anomalies. The trend line is as determined by EXCEL for the absolute data, but the trend value is determined by EXCEL from the anomaly data (not illustrated). I use the anomaly data for the trends for a simple reason: with anomalies, I don’t have to worry about the start and end months to account for the impacts of the seasonal cycles on the trends. The 3.6-deg C span of the average annual cycle (for the period of 1979 to 2017) is listed in the title block. 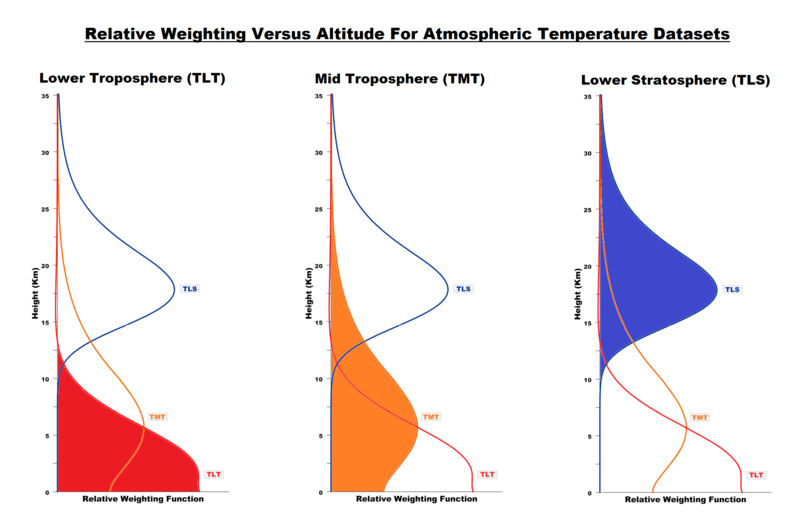 Figure 10 presents the RSS global lower troposphere temperature data in absolute form. That data are available to the public in easy-to-use formats from the KNMI Climate Explorer, on their Monthly Observations webpage, specifically the RSS MSU 4.0 TLT, webpage. There, the TLT data are presented in K, not deg C, the latter of which we are much more familiar, so I added 273.15 to the monthly K values to convert to deg C. As listed in the title block, the span of the average annual cycle (for the period of 1979 to 2017) is 2.6-deg C. The trend for the RSS TLT data is included in the trend comparison graph, not included in this post (example here). Of course, in both cases, as mentioned above, the new perspective shows that the average annual cycles in the global surface temperature data and in the global lower troposphere temperature data are much greater that their respective rises in global temperature from January 1979 to October 2018, based on the linear trends. And as is shown in the post Do Doomsters Know How Much Global Surface Temperatures Cycle Annually?, the annual cycle in the Berkeley Global Land-Ocean Surface Temperature data is much greater than the long-term rise in global surface temperatures, based on the linear trend, from 1850 to present. Yet, according to the newly published and written-by-foolish-politicians Summary For Policymakers of the IPCC’s SR15, a 1.5 deg C rise in global average surface temperatures from the new “pre-industrial” base period of 1850 to 1900 is somehow supposed to cause gloom and doom for the Earth and its occupants. How pathetic can those bureaucrats get in their efforts to scare global residents into submitting to their political agendas?!!!! It’s not working here. We can only laugh at their pitiful efforts. This entry was posted in Global Temperature Update, TLT and LOST Updates, Uncategorized. Bookmark the permalink. I hope you “enjoyed” your hiatus! I didn’t – you were sorely missed, & are welcomed back with open arms and well deserved gratitude!